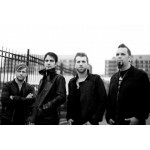 Three Days Grace is a Canadian rock band formed in Norwood, Ontario, Canada in 1992, originally under the name Groundswell. After a breakup in late 1995, the band regrouped in 1997 under its current name with a line-up consisting of guitarist and lead vocalist Adam Gontier, drummer and the backing vocalist Neil Sanderson, and bassist Brad Walst. In 2003, Barry Stock was recruited as the band's lead guitarist. The band is based in Toronto. After signing to Jive Records, Three Days Grace has released four studio albums, each at three-year intervals: Three Days Grace in 2003, One-X in 2006, Life Starts Now in 2009, and Transit of Venus in 2012. The albums have been certified platinum, double platinum, and gold, respectively, in the United States. The band have a string of number one songs on the Billboard Alternative Songs and Hot Mainstream Rock Tracks charts. On January 9, 2013 Three Days Grace announced that lead singer Adam Gontier was resigning from the band because of a "non-life threatening" health issue. Adam Gontier has been replaced for the duration of the tour by My Darkest Days singer Matt Walst, brother of bassist Brad Walst.